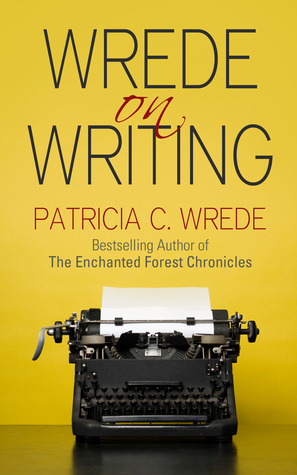 Did you know that Patricia Wrede wrote a book about writing? It just came out in December. For characters, it’s hard to beat Amberglas from THE SEVEN TOWERS, but my favorite book by Wrede is probably . . . oh . . . it’s actually hard to pick. Honestly, it’s hard to choose. One of those. You should probably read all four, if you haven’t had the pleasure of reading Wrede before. The Dragon ones can be read out of order just fine, btw. I read this one first, so I thought of it first, but the whole series is a lot of fun. This is the fourth, but it works well to read before the others. Although I have a major soft spot for the Enchanted Forest Chronicles, which delighted me to no end when I discovered them in middle school. Maureen, those worked for me, and I discovered them as an adult! Nice to see a series that can be read with delight by any age, no matter when you stumble across them. yep. The teenager demanded the paper edition for Christmas. I’d been sending her things from Wrede’s blog ever since she started writing fiction. I’m not a writer, but I think it’s pretty great. Her examples of how the short story writer thinks of ‘Cinderella at a Rock Concert’ vs the novelist’s way, and the various renditions of the same scene in different POV styles are very clear and helpful. Good, because I just ordered the e-copy! Has The Teenager read Orson Scott Card’s CHARACTER AND VIEWPOINT? Because I have always thought that was one of the few books that might be actually helpful as well as insightful and interesting.